The history of Italian ice cream (gelato) is rife with myths and very little evidence to substantiate them. Some say it dates back to frozen desserts in Sicily, ancient Rome and Egypt made from snow and ice brought down from mountaintops and preserved below ground. 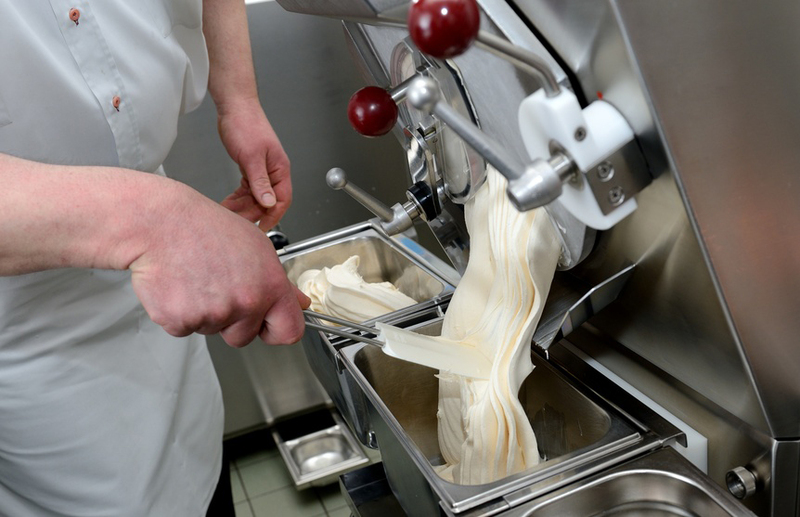 Later, in 1686 the Sicilian fisherman Francesco Procopio dei Coltelli perfected the first ice cream machine. However, the popularity among larger shares of the population only increased in the 1920s–1930s in the northern Italian city of Varese, where the first gelato cart was developed. Italy is the only country where the market share of artisanal gelato versus industrial one is over 55%. Italian ice cream (gelato) is one of the best-loved Italian exports in the world: everyone knows it comes from Italy, but not many may be aware it is a product with a long history, intertwined with the very history of Italian cuisine. A common belief is that Marco Polo brought ice cream back to Italy from his adventures in China. However, just like the story of his introduction of pasta to the country, there are problems with this story: if it is generally assumed that both China and ancient Persia were among the first cultures that developed a dessert made from fruit and either shaved ice or mountain snow, similar discoveries must have been made by numerous cultures that had access to ice and something sweet to add to it. It would take a few centuries before milk or cream started to be added to these ice desserts, thus creating what we now know as gelato and ice cream. Just as with pizza, it is the Neapolitans to be credited with creating the first true ice creams, which appeared in an 18th century cookbook. Once dairy had been introduced, each nationality put their own stamp on ice cream, with Italy creating the flavor explosion known as gelato. 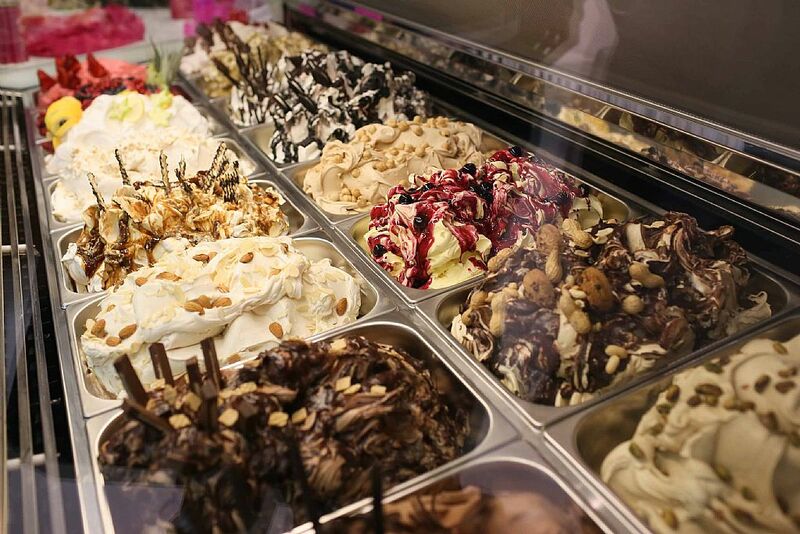 The differences between Italian gelato and ice cream are slight, yet make all the difference in flavor and texture. Is made with milk, sometimes skim-milk as opposed to cream which gives gelato a much lower milk fat content. Less milk fat allows the flavors to really stand out compared to the more blended flavors of ice cream. 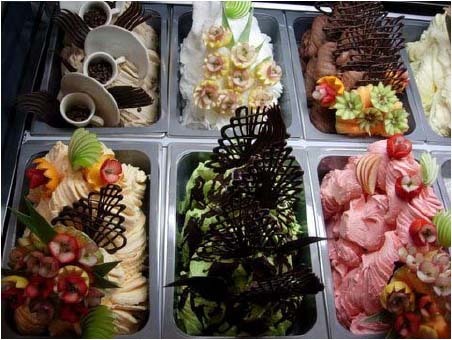 Gelato’s flavor is helped by the fact that it has less air whipped into it than ice cream, making it much denser. Even the serving of gelato is different from that of ice cream, as it should be consumed while softer in consistency, more along the lines of soft-serve ice cream. Fans of ice cream are often surprised as just how flavorful can be and the ultimate chocoholic might find themselves in love with one of the vibrantly colored fruit flavors. All three are more ice and flavorings rather than real ice cream, and have been long enjoyed in the ancient world. Very likely, these desserts were introduced to Southern Italy by the Arabs, who also brought sugarcane to the country. The Arabs used mountain snow and fruit juices to make Sharbat, the ancestor to Italy’s Sorbetto and known elsewhere as sorbet or, indeed, sherbet. 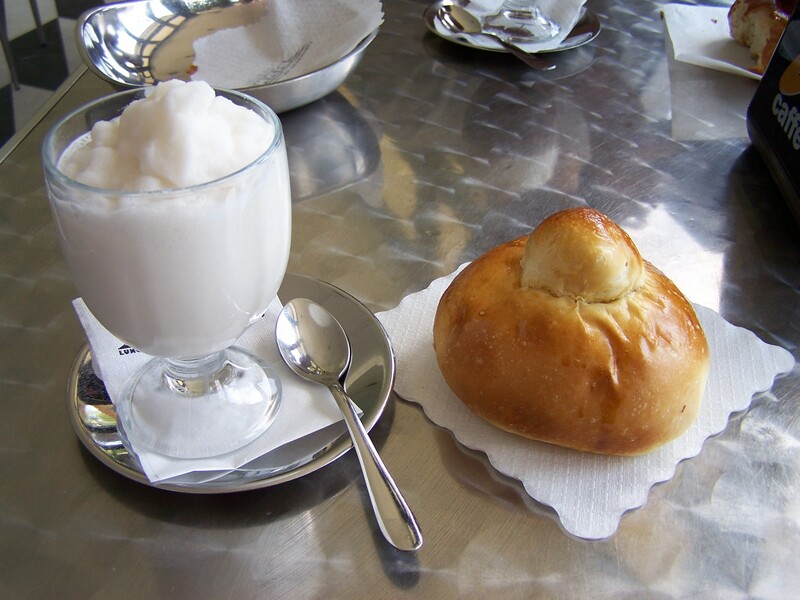 It is in Sicily that a dessert made of ice, sugar and flavorings, known as Granita, was created. Popular in the whole country now, granita is probably the closest thing to the original sharbat as it has a more slush-like consistency than sorbetto. 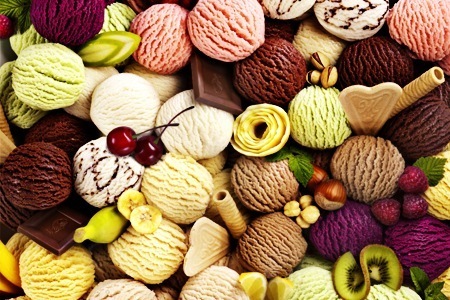 Today, commercial sorbetto can contain small amounts of milk, but many are still made only with fruit juice or syrups and ice: this is what in America is known as “Italian Ice”. BACIO: bacio, Italian for “kiss,” is the name of a classic chocolate confection made with milk chocolate, hazelnuts and dark chocolate. Our version is made with Gianduja, chocolate chips and Piemontese hazelnuts. Nocciola Piemonte I.G.P. HAZELNUT: in Italy, Nocciola is the number-three gelato flavor after chocolate and Crema. ZUPPA INGLESE: The title translates literally as ‘English soup’ but the flavour is more like custard. It gets its name from an Italian dessert which is thought to be inspired by English trifle.